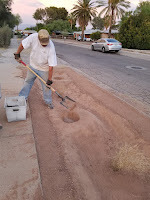 Sustainable Living Tucson: Street-side basin ready to plant the monsoon rain! Street-side basin ready to plant the monsoon rain! 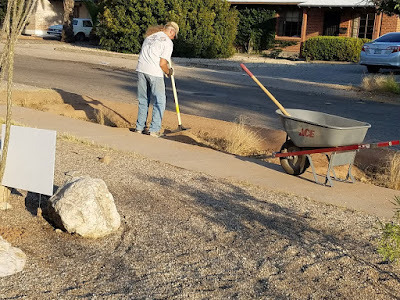 If you've walked your dog down our street in the past few months, you may have wondered what that guy in the sweaty hat was doing digging a ditch in 114 degree weather. Well, I'll tell ya. We are getting ready for the coming monsoons by installing a passive rainwater harvesting system to "plant the rain." The basins will sink the water from our roof and yard into the ground to irrigate the desert trees in our edible forest. The idea is to keep as much rainwater as possible from flowing onto the street and evaporating. The street side basin (above) is the last line of defense, so it is the deepest. 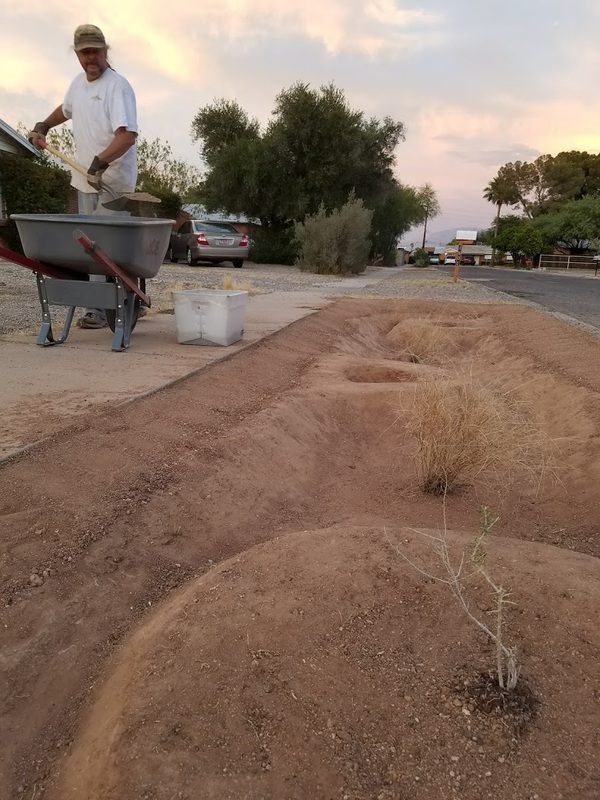 If it works as planned, the street will be lined with a lush stand of moringa and wolfberry bushes. This process has taken some time, planning, and plenty of sweat equity (especially on Dan's part.) Dan learned how to install passive rainwater systems by participating in Watershed Management Group's co-op workshops. At the workshops, co-op members get detailed instruction while working on passive (basins and berms) or active (cisterns) water harvesting or greywater systems. 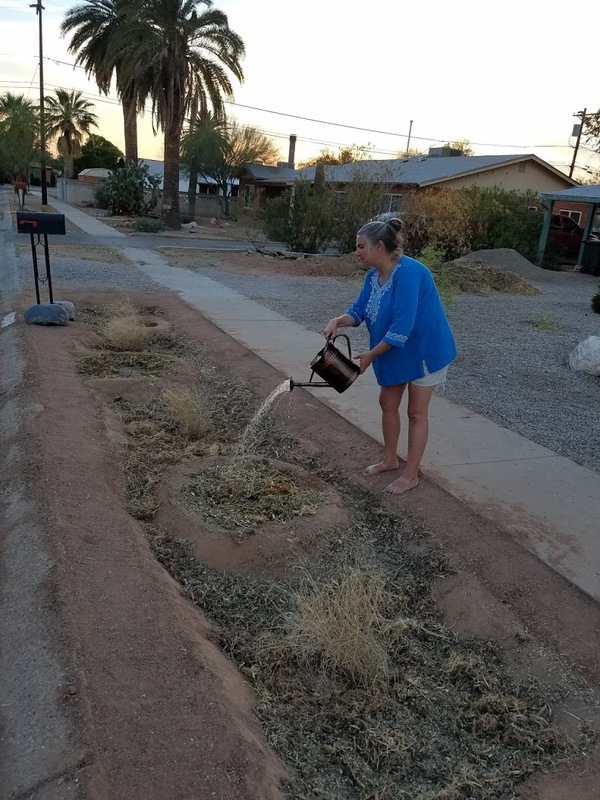 After volunteering for 16 hours, you can host a workshop in your own yard. If you have the money, I would highly recommend it. But to save money on the initial design consultation and co-op supervisor's fees, Dan decided to do the work himself. What a man! 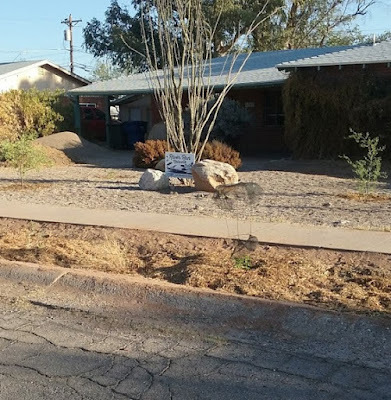 *note: I think everyone should be able to afford to install waterharvesting features in their yard. Apparently Watershed Management Group agrees. They've now offer a rainwater harvesting grant and loan program. 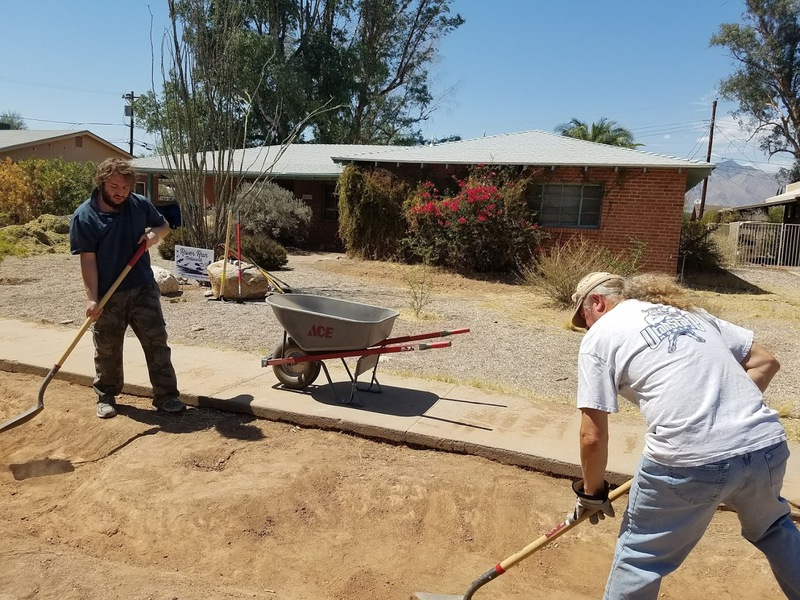 They also offer the free classes required to qualify for Tucson Water's rebate program. 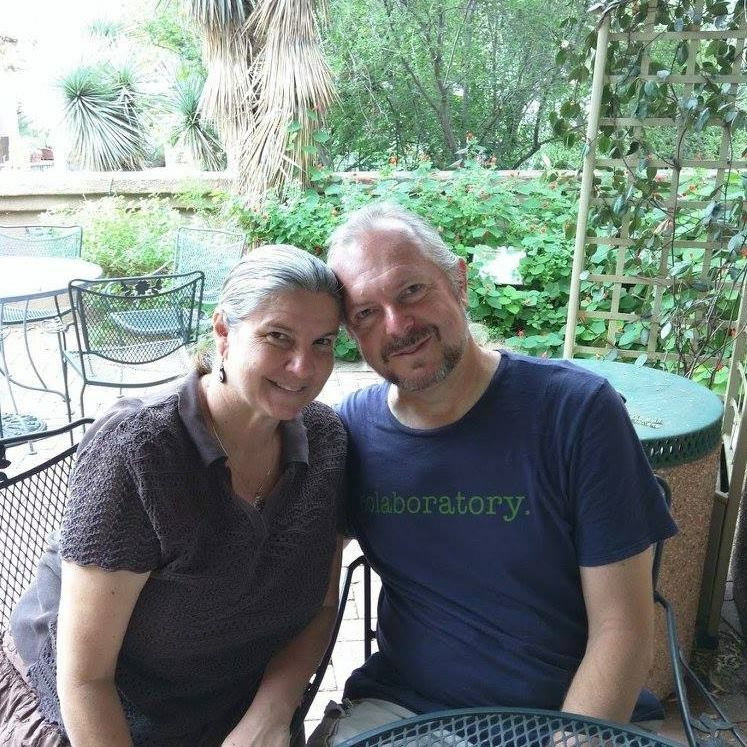 If you need inspiration, check out WSM's free living lab tour. It's fun! 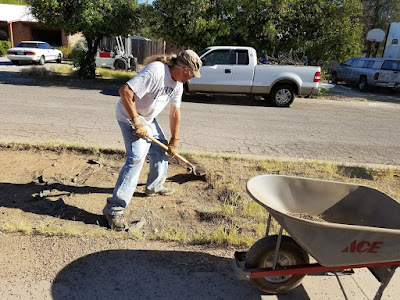 Dan started by digging out gravel interspersed with (the bane of our existence) bermuda grass. That is one reason that this catchment basin is so deep. Some (sane) people would hire someone to excavate it with a backhoe. I would definitely recommend that if you have the money. 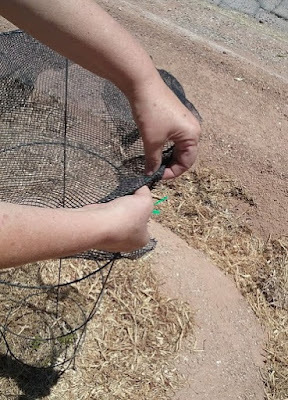 After Dan dug out the first layer of weeds, he had to remove a layer of plastic. Just under the plastic he found roots forming an elaborate design. 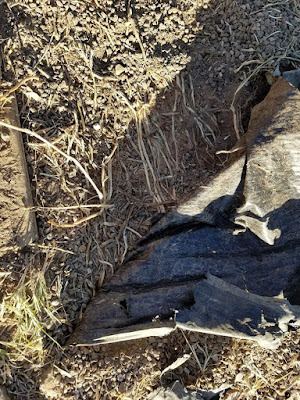 I got out as much of the roots out as possible. But the next day the grass under the sidewalk started growing again. Those weeds are invincible! They will be here with the cockroaches when we are long gone! I read somewhere that if you spray weeds with vinegar nothing would ever grow in that dirt again. Desperate times call for desperate measures. 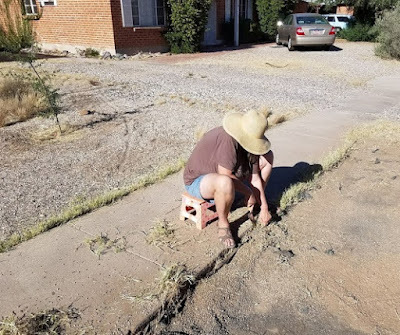 So I sprayed vinegar right on the roots under the sidewalk. Those friggen weeds were everywhere! Here is my son Josh attempting to separate the weeds from the gravel. 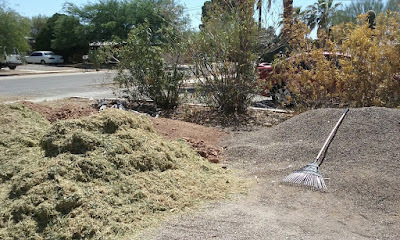 We still have 3 piles in our driveway: gravel, clay soil & palo verde mulch. (Four if you count the WEEDS! Argh!) 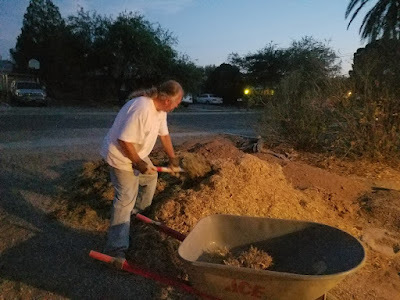 We got free organic palo verde mulch from Romero Tree service. 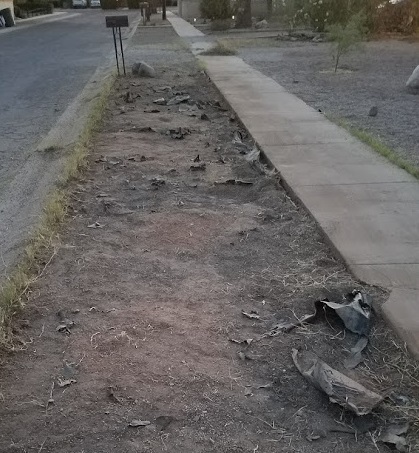 They are happy to drop by the chipped remains of the tree they just pruned in your neighborhood! The only thing about our palo verde mulch is that there were still seed pods in the branches when they pruned it. 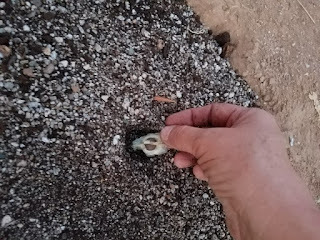 A few of them actually sprouted, but I caught them while they were still small and easy to pull. 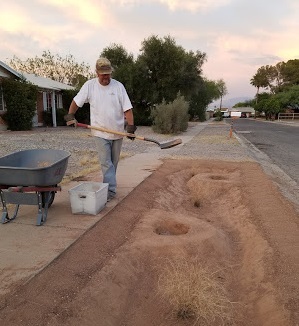 After removing all the gravel and grass, Dan started shaping the basins. 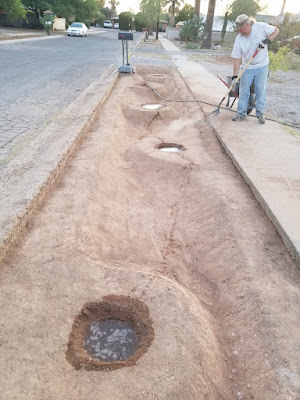 He left truck-tire-shaped mounds to plant the trees and bush in. 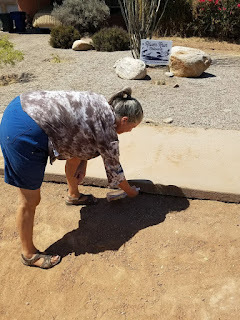 He made sure the floor of the basin was smooth - so there would be no puddling. Before planting, we did a percolation test. I filled each hole with water to make sure it would seep into the ground in a timely manner. We planted the little wolfberry bush we got at Desert Survivors in one of the holes. Dan replanted some desert grass from our yard into the catchment basin. (No! Not bermuda grass!) 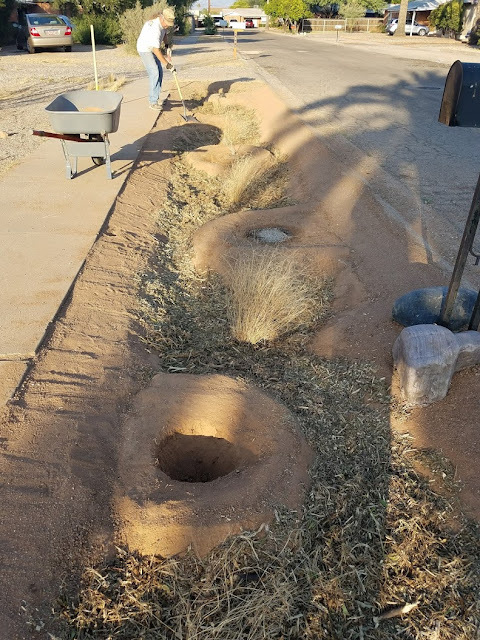 The roots of the native grass create a sponge to keep the water in the ground. 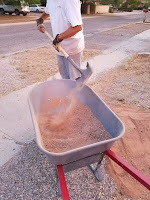 We mixed some sand we got from a nearby wash with the clay soil and put it in the bottom of the hole. 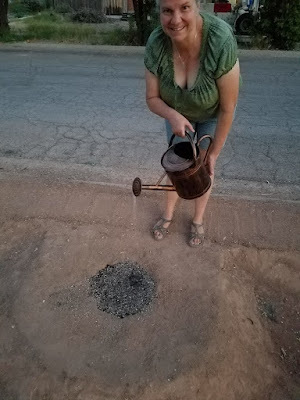 (Moringa seeds need good drainage.) 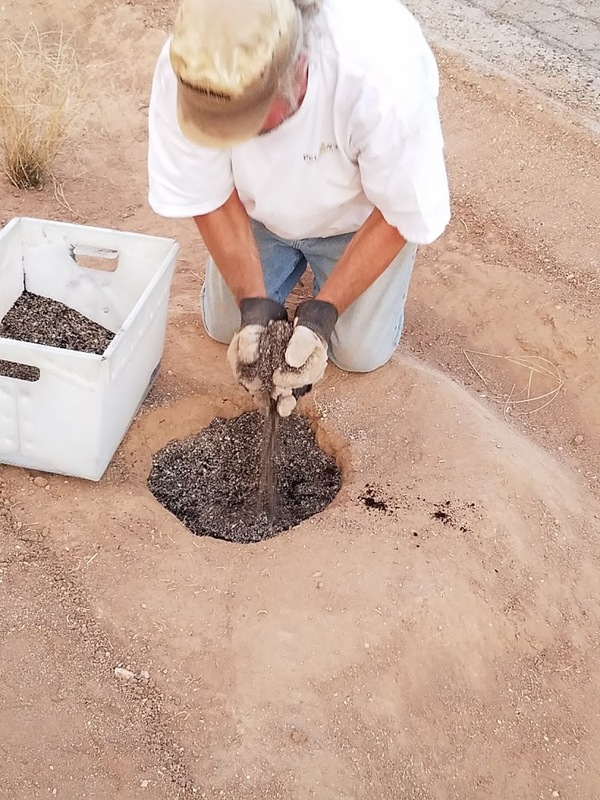 Then Dan mixed the rest of the soil mixture with some organic potting soil and filled up the hole. 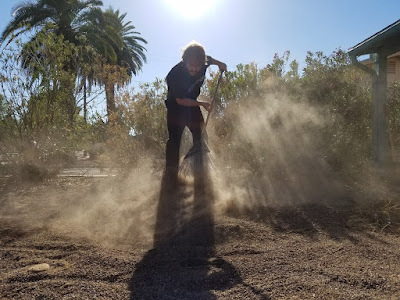 I planted 3 moringa seeds in each mound (about 1/2 inch deep) and watered them! 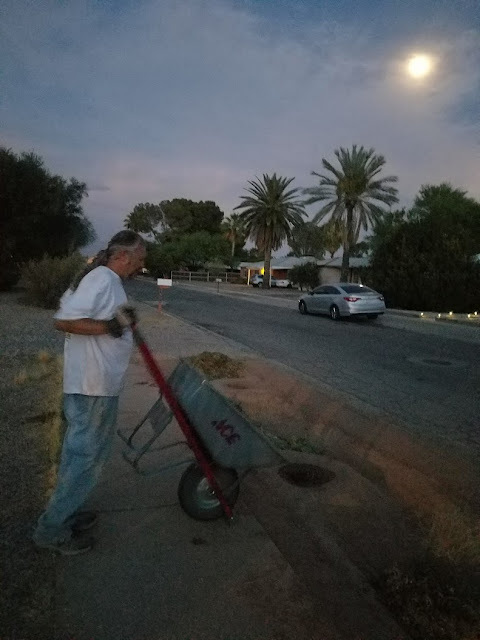 Dan worked by porch-light, then moon-light shoveling palo verde mulch into the basin. The mulch is so important to keep in the moisture - especially in the desert! Dan tamping sides of basin to make sure they don't wash away. 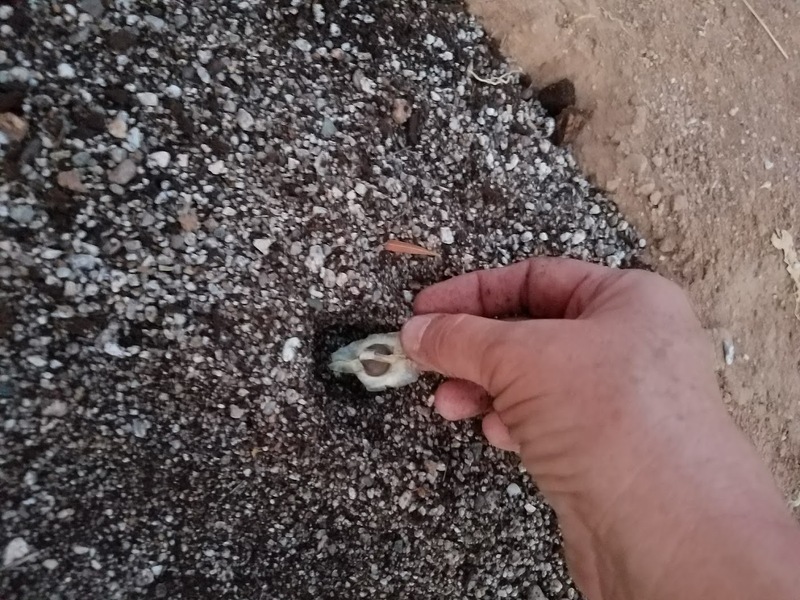 I watered the seeds just enough to keep it moist without soaking it. 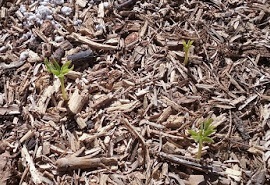 In one week the moringa seeds actually spouted! Yeah! 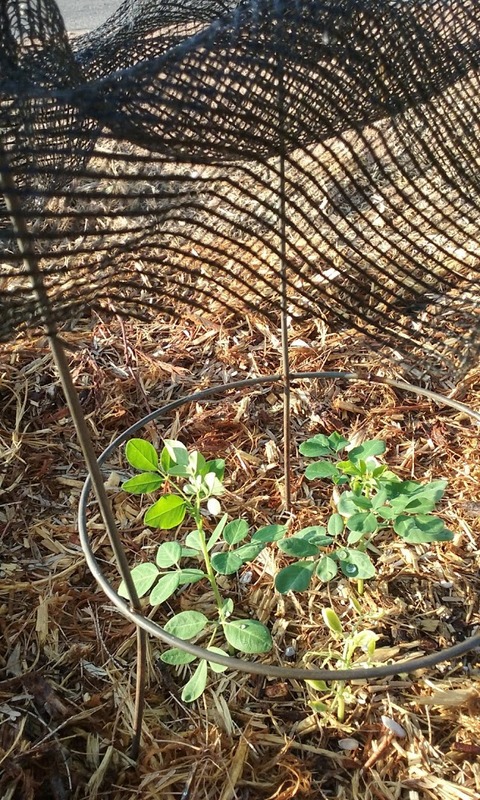 Then I deep watered the moringa and the hackberry bush every other day. I was worried about them in the 112 degree weather, so I put up some shade netting. It also seems to help to water late at night. They are looking good. Growing new leaves! Thanks for sharing your story and for your words of support! What a labor of love. Please post pictures when or after it rains so we can see how the water collects. I love this idea and enjoy following your blog. Thanks, Linda! Hopefully we'll have some photos soon! Where is this. I would like to see it. My moranga grows good for Dr real months then leaves turn yellow and dies. I have in a large pot on my patio. 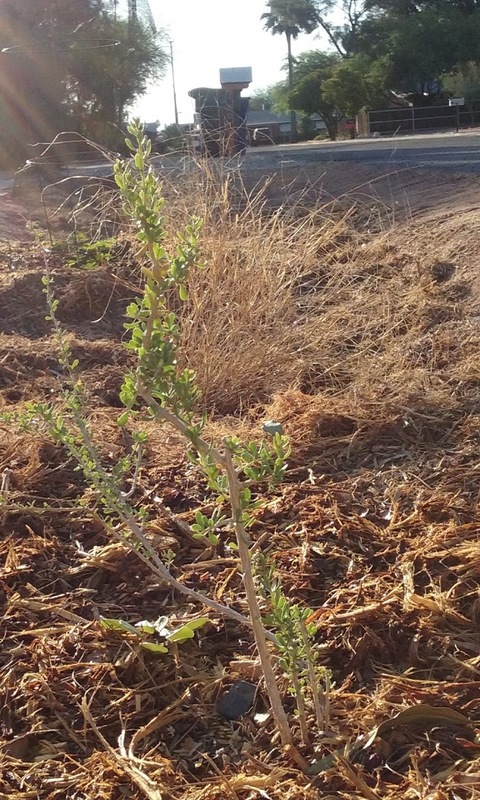 We are not sure how our moringa plants will fare if it gets cold. We plan to keep them shrub height so we can cover them with a tree cover in freezing weather. 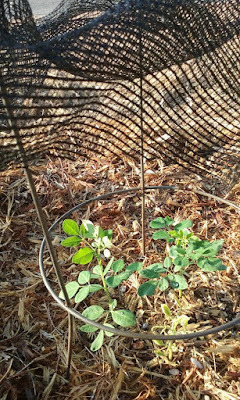 I read that the roots of the moringa plants go straight down. Does your potted plant need more room for the root? Way to go, Dan, Jana, and Josh!